Hundreds of earthquakes occur every year. Most earthquakes do little damage, but a few can cause terrible destruction, in which many people are hurt or lose their lives. Scientists who study earthquakes are called seismologists. These scientists have discovered a great deal about earthquakes in recent years. A seismologist is able to record an earthquake that occurs thousands of miles away at seismic observatories. Within the the earth there are forces which bend the earth’s crust. Scientists do not fully understand these forces, but they do know that the crust is bent until it snaps. After snapping, the crust in certain areas springs back into place. It then leaves evidence of a crack, or fault. This part of the crust can remain quiet for many years, or even centuries. The same forces continue to bend until it snaps again, most likely along the same fault line. When the snapping or bending of the earth’s crust occurs it is called an earthquake because it makes waves that causes the whole earth to shake. Have you ever dropped a pebble into a pond? When you drop a pebble into a pond, you see tiny waves, or ripples, spreading outward in ever-widening circles. Although, water seems to be just one body, it is made up of individual particles. When a pebble is dropped in a pond, it pushes the water nearest to it. That water pushes (or pulls) the nearby water particles in all directions. That push is what we call a wave. It is not the water that moves out in all directions, it is the push. A wave is the push. An earthquake works in much the same way. It sends out waves in all directions. These are called seismic waves. Place the palms of your hands together and slide one quickly against the other. This movement represents two rock surfaces slipping, one against the other. The fingertips of the hand that moves forward pushes the air particles ahead of it. In the same way, the rock surface which moves forward pushes the particles ahead of it. Then these particles push the rock particles ahead of them. This push is felt throughout the earth. This is called a push wave or a compression wave. The wave travels at an average of 5 miles (8 kilometers) a second, but the speed increases with depth. The wave can be detected anywhere on the surface of the earth by a sensitive instrument called a seismograph. Earthquakes also send out a second kind of wave. As before let the palms of your hands represent two rock surfaces. This time put a pencil between them. Slide one hand forward to represent the slipping rock surfaces. The pencil rotates, or twists, as you move your palm. In the same way, the rock particles between the slipping surfaces are twisted. The twisting particles send a torsion wave, or a twist wave, throughout the earth. A twist waves travels more slowly than a push wave, moving through the earth at about 3 miles (5 kilometers) each second. Since the push wave travels faster, it arrives first. We call it the primary wave or the P wave. The torsion wave is called the secondary wave or S wave. The difference between the speeds of P and S waves enables seismologists to tell how far away from he observatory an earthquake is. When an earthquake occurs the snapping of the crust sends out these two kinds of waves – the fast push waves and the slower twist waves. The observatory seismograph registers each wave and records the exact time of its arrival. From this and other known facts, the scientist can calculate the exact distance of the quake from the observatory. Observatories in other parts of the world will have recorded the same earthquake. Their seismologists have figured out the distance. When three different observatories pool their information, they can determine where the earthquake occurred. Suppose that the earthquake is 5,000 miles (8,000 kilometers) from a San Francisco observatory. The earthquake would lie on a circle of that radius from San Francisco. A New York observatory measured the quake at 4,500 miles (7,200 kilometers) away; so the earthquake would lie on a circle of that radius from New York. In Stockholm, Sweden an observatory measures the quake at 7,500 miles (12,000 kilometers) away. It must lie on a circle of radius from Stockholm. Three such circles are drawn on a map of the world. The place where they intersect is the location of the quake. The circles intersect in northern Chile. From the records of the three observatories it is determined that the quake occurred in northern Chile. Actually, several hundred seismographs are kept in continuous operation all over the world. Each sends daily reports to the Division of Seismology of the United States Coast and Geodetic Survey. It is from here that the necessary circles are drawn on a large globe and the official location of each earthquake is issued. Computers are a great help in speeding up the work of locating earthquakes. Information coming from the reporting stations is entered into the computer and the computer determines the distance of the quake from each reporting station. It also calculates the location of the earthquake and its depth below the earth’s surface. Locating and recording earthquakes in this way has resulted in a very accurate map of all the earthquake centers in the world. Scientists have learned some amazing things from these maps. Earthquakes are limited to certain areas (or belts) of the world. The rim of the Pacific Ocean is the most important of these belts. Another belt stretches from China to Southeast Asia to the Mediterranean areas of Africa and Europe. A third earthquake belt is a long ridge that lies under the Atlantic Ocean. Some scientists believe that hot lava from the mantle of the earth bursts up through the ocean floor along this ridge, and similar ridges under others oceans. Some of this lava, from the layer just beneath the earth’s surface, adds height to the ridges. Most of it flows away from the ridges, causing a gradual spreading of the ocean floor. This spreading movement of the ocean floor has led some scientists to suggest a new theory in explaining earthquakes. According to this theory, the earth’s crust is made of many great flat plates that rest on the mantle. The plates move, carried by the slow flow of material in the mantle. The locations where the the edges of the plates slide past one another are the earthquake belts. If two plates block each other, the sliding motion temporarily stops. Great pressure builds up as the plates jam together. This pressure may cause a sudden slippage and release the plates. This sudden motion is the earthquake. Seismologists discovered an interesting fact through the work of locating earthquake centers. About ten percent of each year’s earthquakes presented scientists with a puzzle. These quakes could not be located in any geographical position that agreed with the distances recorded by various observatories. It was first thought that some of the observatories must have been making mistakes in determining their distances. The same thing kept happening year after year with some of the best observatories seeming to be in error. Seismologists decided there had to be another explanation. Could it be that the ten percent were a different kind of earthquake altogether? Scientists now know that they are different. They do not occur at the surface of the earth. They occur deep down in the earth, sometimes as deep as 465 miles (750 kilometers) below the surface. How can the depth of such a quake be measured accurately at a seismic observatory? Suppose that an earthquake occurs 465 miles below the surface of the earth, and there is a seismic observatory directly under the earth – that is, the observatory would be located on the far side of the earth. Some waves from the quake will travel directly to the observatory. Their path would be 465 miles shorter than it would be if the quake occurred on the earth’s surface. Other waves will take a longer route. At first they will shoot up; they will be reflected off the earth’s crust, and only then will they travel to the observatory. The reflected waves travel a greater distance, arriving at the observatory later than the direct waves. The arrival time of these waves are recorded on the seismograph. Scientists know the speed of the waves and the difference in their arrival times. They can then calculate how much farther the reflected waves traveled; from this they learn how deep the earthquake was. The direct wave from a deep quake to the observatory is called the P, or push, wave. The wave bounced off the crust is called the pP; the little p shows that the wave has traveled a short distance up to the crust before being bounced of the P wave. Seismograph records of each earthquake make it possible for seismologists to determine the geographical position of the quake and its depth below the surface of the earth. Usually, no cracks are visible at the surface of these deep quakes. They are felt over a wider area than a surface quake. They do less damage at the surface, since the fracture is some distance underground. Most earthquakes occur within the upper 15 miles (25 kilometers) of the earth’s surface. Once every few years a quake may occur as deep as 465 miles (750 kilometers). At a depth of 400 miles (650 kilometers), there could be five or six quakes in a month; at 90 miles (150 kilometers), there may be as many as 30 quakes in a month. Surface quakes may run as high as 100 in a month. The number of earthquakes may vary greatly from month to month, however, the yearly average does not vary much. When we consider how many earthquakes there are in one year, the number of earthquakes which cause terrible damage is small. The extent of the disaster in an earthquake depends on many conditions. If buildings are well constructed and are built on solid ground, it has a better chance of surviving an earthquake. Most injuries and deaths during earthquakes are because of poor construction and faulty building sites. Another serious element is not knowing how to respond to an earthquake. When people panic and rush out into narrow streets there is a danger of being trampled or suffocated. Through the United Nations and UNESCO much has been done to lessen the damage done by earthquakes. UNESCO has sent a team of expert seismologists to every country known to be subject to earthquakes. Working together with local geologists and engineers, the experts have studied the ground and the type of building construction commonly used. They then suggest the most effective building code for that area. If these suggestions are used it may prevent disastrous effects of earthquakes. There is one type of earthquake that little can be done about. This is the disaster produced by seismic sea waves, or tsunamis. Tsunamis are often called tidal waves, which is incorrect. They have nothing to do with tides. In certain areas on our planet, such as off the northeast coast of Japan and off the Aleutian Islands, earthquakes occur beneath the sea. Sometimes these earthquakes cause seismic sea waves. They may not be noticed out at sea because of their long wave length. When they roll into harbors and inlets, they may pile up into walls of water 6 to 60 feet (2 to 20 meters) high. 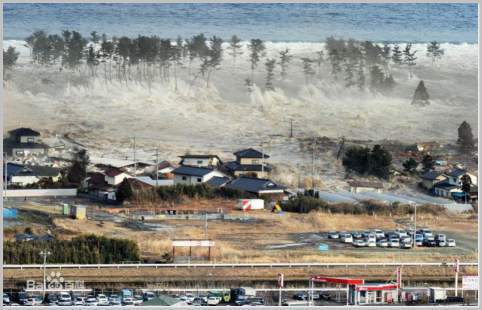 The Japanese call them “tsunamis,” which means “harbour waves,” because they reach such heights only in harbors. Tsunamis can travel at speeds up to 500 miles (800 kilometers) an hour. There is a warning system for all shores likely to be reached by the waves. This enables people to evacuate the threatened shore and go to higher ground. There is no way to stop the incoming wave. Aided by powerful computers and scientific instruments scientists have been successful in predicting several earthquakes. One important clue in the work of predicting earthquakes is the usual behavior of primary and secondary waves that are recorded almost constantly on seismographs. These waves come from a number of very minor earthquakes, some from explosions set off in mines, and some from underground nuclear explosions. Some scientists in Russia observed that the waves traveled at less than normal speeds. The slowdown lasted for a time, then the waves returned to normal. Shortly afterwards, the earthquake occurred. Some scientists have a theory that may explain the unusual behavior of the seismic waves. An earthquake area is under incredible pressure. The pressure opens millions of tiny cracks in the rocks, which accounts for the slowdown of the seismic waves. The water seeps into the cracks. The water does two things. It restores the ability of the rocks to carry seismic waves at normal speed. It also weakens the rock, so that the rocks soon breaks, causing the earthquake. Another theory is based on the gaps of seismic activity along a fault. These are called gaps because there have been no earthquake tremors in the area for at least 25 years. Theory states that the earth’s plates are pressing on each other so hard along the seismic gap that they lock together. Enormous pressure builds up which one day will be released with a major earthquake. Scientists are looking for ways to control earthquakes. Experiments have shown that small, harmless quakes can be triggered in an area by pumping water under a very high pressure into very deep wells. These small quakes relieve the pressure that might eventually cause a dangerous quake.